It is spring in NZ, well it certainly was this morning but now the rain is back and another cold snap with it and I am ashamed to say I have just turned my noisy heat pump back on. The promotional brochure, stated 'quiet', however quiet it is not! How I wish I had central heating, when we lived in the UK my whole house was toasty and silent, I wonder, is it because I conjure up images of those cumbersome radiators found in our state schools. Central heating designs have come a long way since the days of those old fashioned curvatures. I took a look around the Internet and discovered vertical and horizontal designs befitting the most contemporary homes. I started my search in the UK and discovered Best Heating who is definitely keeping up with the trends across their entire heating range. I knew we had come a long way since our old fashioned school radiators; however I was surprised at the range of finishes and designs I discovered. Glossy red, metallic silver and chrome, black gloss and anthracite with mirror inserts. Traditional styles are still available alongside the sleek designer look; I even spotted a wave effect that looked more like a piece of art than a radiator. Above: If you want to go for a dramatic look then choose an accent colour that will work with your interior. 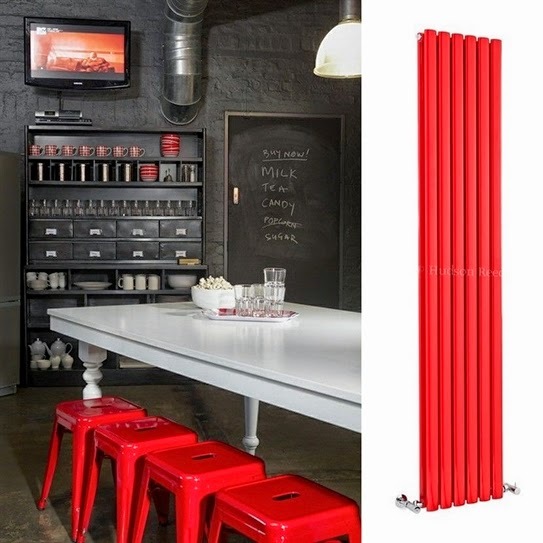 This red, vertical radiator would look stunning in this industrial style kitchen. 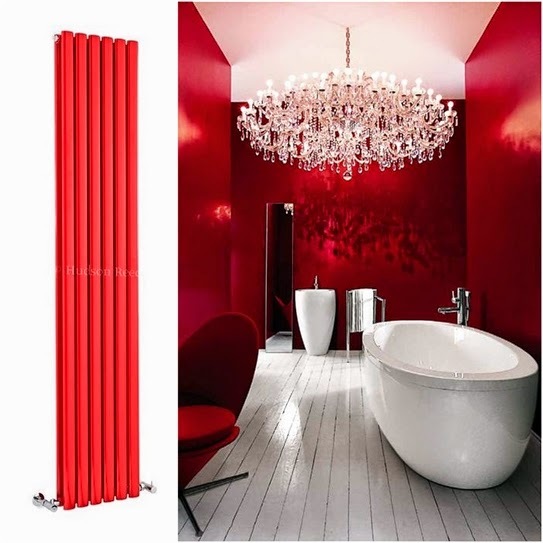 Above: A vertical red radiator in this thoroughly modern bathroom would enhance the drama and lead the eye upwards. Alternatively a tall column heater in white would further add contrast to the red walls. 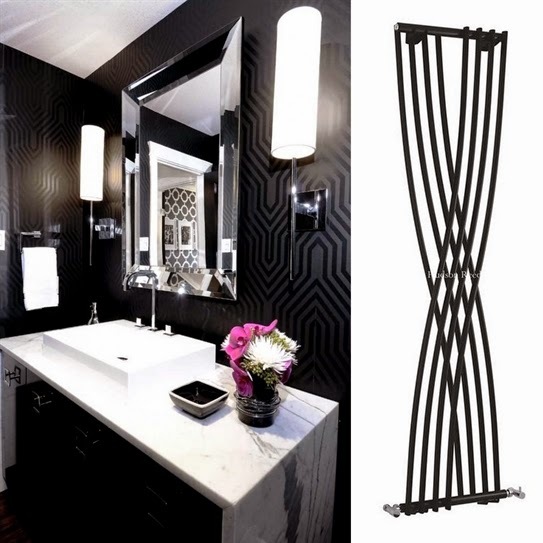 Above: This Hudson Reed Xcite designer radiator would compliment the graphic design of the wallpaper and add further interest to this black and white contemporary bathroom. 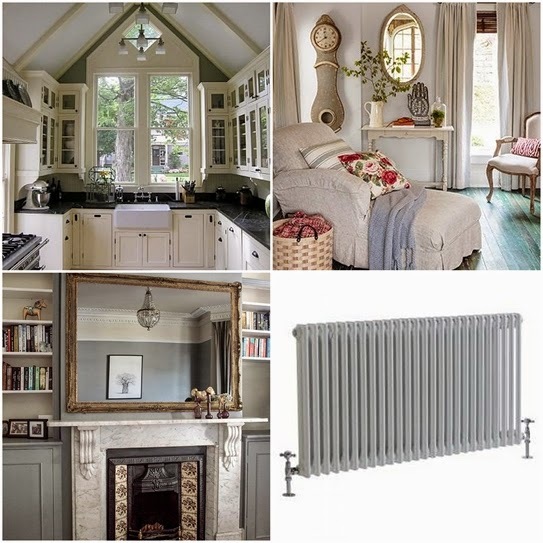 Above: If you have more traditional home decorated in a country, cottage or Hamptons style, a traditional column radiator is the perfect choice. I wonder if this post might have you thinking about installing radiators, especially if you are thinking of building a new home. They are efficient, great space heaters, silent and as you can see there is a design to suit most interiors. I couldn't share all the designs, so if you want to explore more, hop over to Best Heating for more inspiration and information on their products.